Skiathos holiday with Greeka.com: Skiathos is the most cosmopolitan island of Sporades, with fabulous beaches and much greenery. Skiathos is the westernmost island of the Sporades, only two hours away from Volos by ferry. It is a popular place to oraganise holiday in Skiathos. It is the most developed Sporades Island from the point of view of touristy facilities and offers goods services, infrastructure and organisation. Even if tourism is a recent phenomenon in Skiathos island, it has extended very quickly and the commercialization of the little island has now almost reached the ones of islands like Corfu, Mykonos and Rhodes. Package tourists from Europe and wealthy visitors from all over the world are the main clientele of Skiathos. 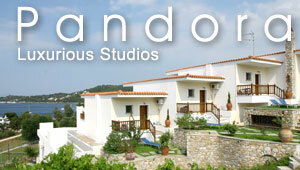 The island has only one settlement, Skiathos Town, which is the port and capital of Skiathos. The rest of the island consists in beautiful large beaches, churches, archaeological sites, many supermarkets, villas, restaurants and numerous huge hotel units. Holidays in Skiathos is ideal for those who love exciting nightlife, shopping, crowded beaches, great fun and entertainment. Nevertheless, the crowded aspect of Skiathos doesn't take away the island's beauty: picturesque walks, hidden valleys, a few quitter beaches, caves, sculpting rocks and small coves are the many jewels one can find in Skiathos if he takes time to explore the island. In fact, Skiathos has provided the setting of a Hollywood film, the famous Mamma Mia movie.